I bought the strings, searching for some deviations of the standard Phosphor Bronze strings. So, comparing to your default D'Addarios or Martins these strings produce a bit more dry, crunchy yet bright and well-balanced sound. Probably, to the aforementioned general sonic qualities the strings tend to "scream" rather than compress when played really hard. Overall, I like Ernie Ball quality and I am using the other 80/20 set for my all-mahogany guitar. 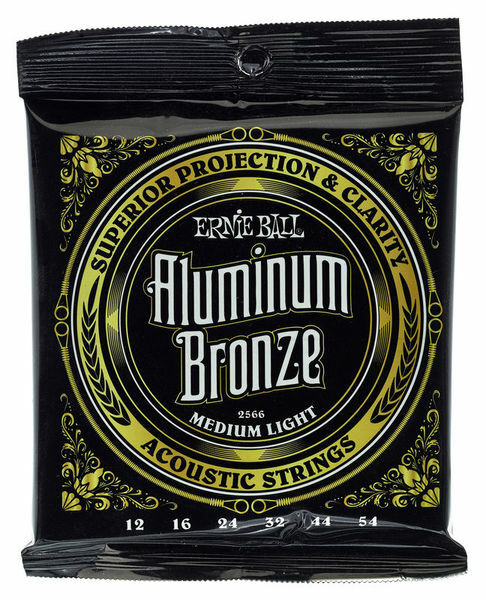 What comes to these particular Aluminium Bronze set, I will rather use one when I'll need to add a vintage touch to a modern acoustic. These are a noticeable difference in sound. More punch in the mid-range and bass. The highs are not as pronounced. Really what my sapelle guitar needed. I'm waiting to see how long they last. I think these will probably replace the Martin SP Phosphor Bronze set I used to use. ID: 350890 © 1996–2019 Thomann GmbH Thomann loves you, because you rock!